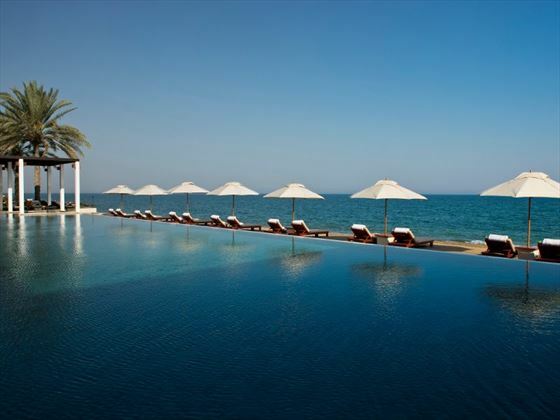 Serene and contemporary, The Chedi Muscat is a luxurious beachfront resort sitting on the fringe of Oman’s capital city. 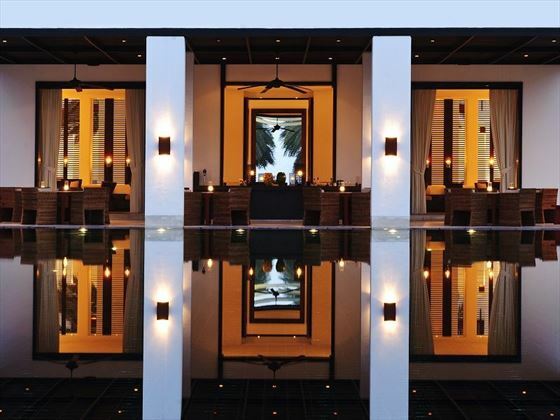 It is set across 21 acres of gardens and opening out onto a private stretch of golden beachfront. 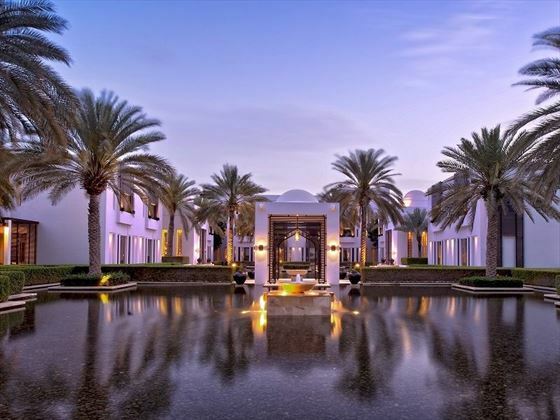 This is a chic retreat perfectly suited to couples looking for a short break close to the city or those on a short stopover in Oman. 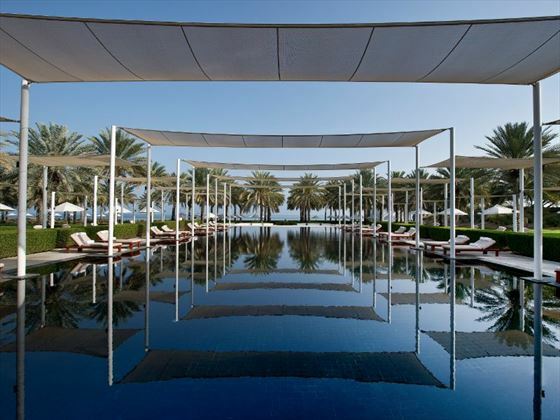 Located directly on the Gulf of Oman, enjoying a breathtaking backdrop of the Hajjar Mountains, The Chedi truly enjoys the best of Muscat’s scenery. 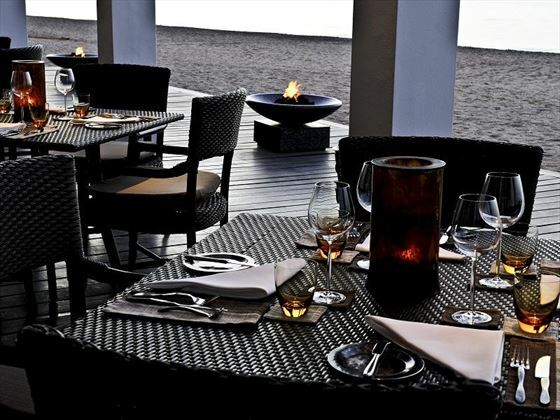 And you’ll find a tranquil atmosphere to match the setting – there’s an upmarket, mature feel to the resort. 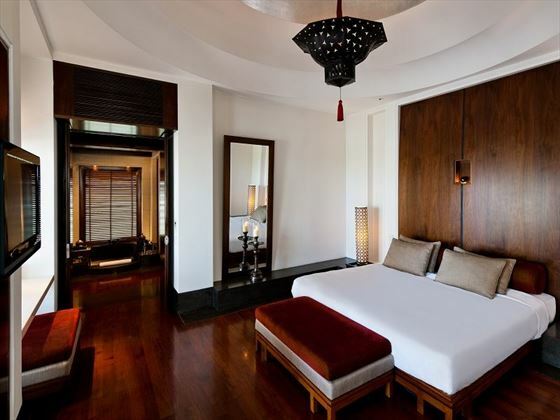 The styling is modern and minimalist with flourishes of Omani décor. 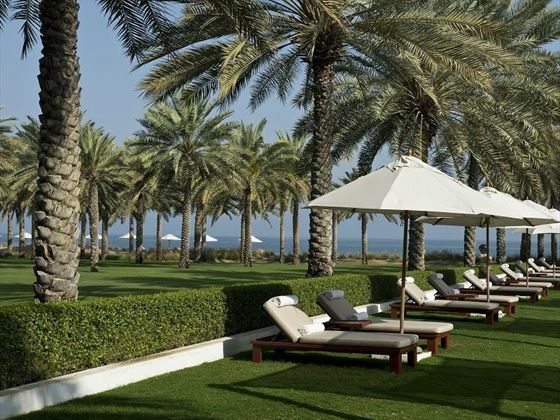 Wander through the manicured gardens or take a leisurely stroll on private golden sands and soak up the stress-free ambiance. Even during busy periods the resort remains uncrowded. There are three pools – two of which are adult-only – and a world class spa with a great selection of massages, treatments and therapies on offer. 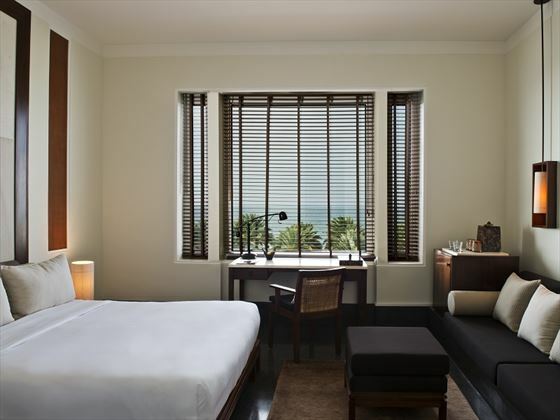 The accommodation is spacious and generous equipped with free Wi-Fi, complimentary minibar items and lavish amenities. There’s a range of great restaurants on site too with opportunities for everything from beachside al fresco meals to private dining. 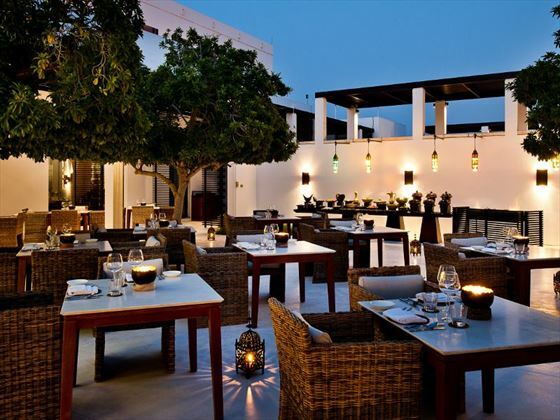 The resort’s main restaurant has four open kitchens, serving a blend of international classics to Middle Eastern specialities. 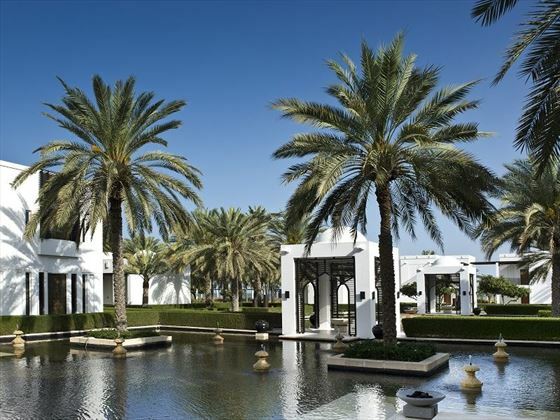 The Chedi is close to the centre of the city – only around 10 minutes from the Sultan Qaboos Grand Mosque and the city centre and a little further to the attractions of Old Muscat. 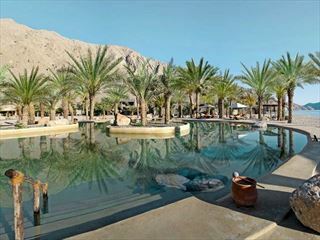 It’s also close enough to the Hajjar Mountains for day trips and excursions in the area. 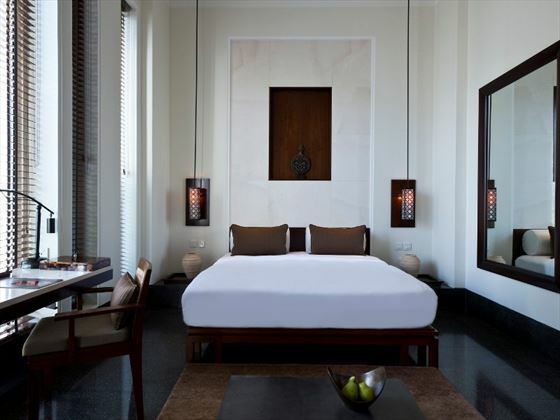 There are no twin bedded rooms in any of the Chedi Hotel room categories. Please note that there is building work currently being undetaken next to the Chedi property, expected to completed by the end of 2019. Minimal disturbance is expected. Work will take place from 6am - 7pm. Please note that if your flight arrives before 9am on the day of arrival you will be required to pay a early check in supplement at time of booking. If your flight departs after 7pm you will also be required to pay a late check out supplement at time of booking. Please speak to our sales staff about this. Anantara Al Jabal Al Akhdar Resort is the highest five star resort in the Middle East & amongst the highest in the world, located 2000 metres above sea level on the curving rim of a great canyon. 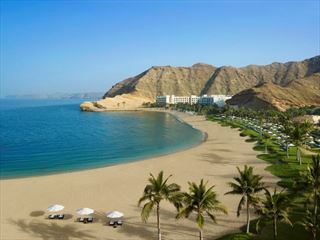 A true rare jewel in the rocky contours of the Saiq Plateau on Oman's fabled Green Mountain. 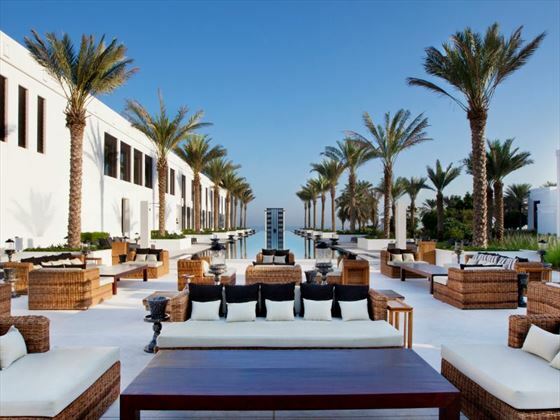 Nestled amidst the soaring mountains of Oman's Musandam Peninsula, this gorgeous hotel offers true luxury with a touch of authentic Arabian charm. The hotel has its own marina, two pools, an award-winning spa, and incredible dining experiences - including dining atop a scenic mountain. Great for families.